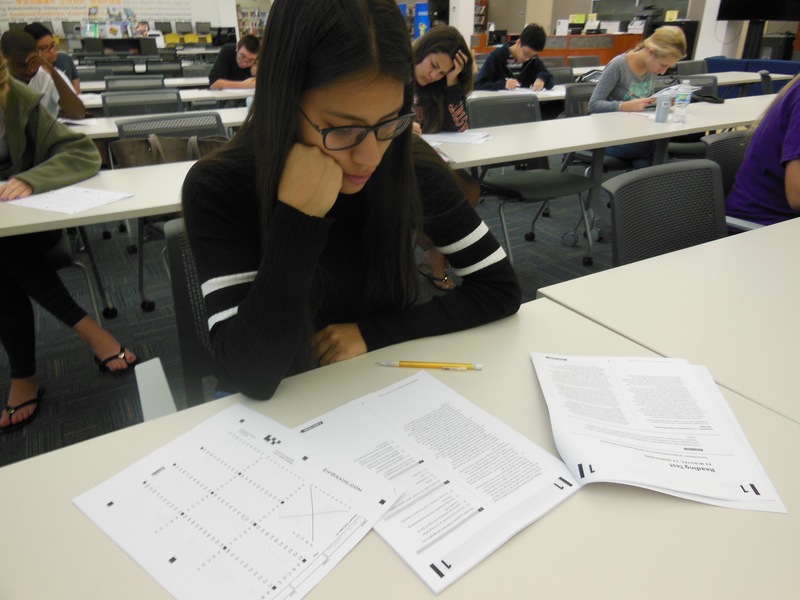 The Preliminary SAT boot camp provided a new study opportunity to help increase students’ scores on all three parts of the upcoming exam. Students start the course at the end of their sophomore year and finish the course in October of their junior year, right before the PSAT administration, which occurred this year on Oct. 11. By the time the boot camp came to an end, students completed a total of 76 preparation hours. Junior Gracie Lorber thoroughly interprets a question on the reading portion of her practice PSAT exam at the boot camp in the media center on Sept. 21. The boot camp is administered by Mindworks through a partnership with the school in order to increase the number of National Merit Scholars in the junior class. The PSAT boot camp is administered through the tutoring company MindWorks. It was founded on the premise that every high school student deserves to get accepted to their dream college. “The partnership between Mindworks and Pompano Beach High School was built right away since there were common goals we both wanted to achieve,” Mindworks founder Andrea Catsicas said. The camp took place in Tornado Alley every Thursday after school until 5:30 p. m. and Fridays from 8:00 a. m. to 2:00 p. m.
Junior Thabasya Veeramani fills in an answer bubble on the reading portion of her practice PSAT exam at the boot camp in the media center on Sept. 21. The boot camp is administered by Mindworks through a partnership with the school in order to increase the number of National Merit Scholars in the junior class. However, the trainings did not run cheap. Students paid close to hundreds of dollars for everything that the program included. Catsicas would not provide the specific cost for this year because the overall cost changes every year, but there is always a cheaper cost for students who have free or reduced lunch and a greater cost for students who do not have free or reduced lunch. According to Catsicas, the main goal of the camp is for juniors to obtain a score on the PSAT exam that will qualify them for the National Merit Scholarship title. Junior Ethan Cronk rests deep in thought while reading one of the stories on his practice PSAT exam at the boot camp in the media center on Sept. 21. The boot camp is administered by Mindworks through a partnership with the school in order to increase the number of National Merit Scholars in the junior class. At the bootcamp, students were able to take many practice exams that helped them become familiar with the curriculum on the exam. “I have learned a lot of additional tips and tricks through going over practice tests with the instructor,” junior Camila Castellano said. The program creates a customizable experience for each student based on the previous practice test they have taken.